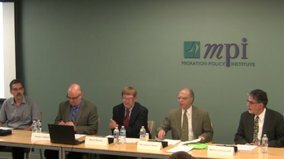 The Migration Policy Institute October 20, 2016 hosted a seminar, Farm to Table: The Role of Immigrants in U.S. Farm Labor in 2016, that drew 60 participants in-person and more online. Agriculture has longed played a special role in especially Mexico-US migration, as the US government twice approved the recruitment of Mexican Braceros to fill jobs on western farms, and allowed workers from Jamaica and other Caribbean islands to fill farm jobs along the eastern seaboard. Today hired workers do most of the work on US farms, three-fourths were born abroad, usually in Mexico, and many are unauthorized. The discussion focused on three themes. First, labor-intensive agriculture has continued to expand, as consumers buy more berries and other handpicked fresh fruits and vegetables. Second, the hired farm workforce increasingly consists of settled and unauthorized parents with US-born children, a change from a more mobile solo male and mobile labor force in 2000. Third, the slowdown in Mexico-US migration since the 2008-09 recession, combined with higher minimum wages in many US states, has pushed up the real hourly earnings of farm workers faster than nonfarm workers in recent years. The discussion highlighted the expansion of labor-intensive agriculture in response to rising consumer demand for new varieties of apples, more fresh berries and vegetables, and more locally grown produce. Average employment on US farms is rising, up over 10 percent in the past decade, as farmers respond by planting more commodities. The workers who produce these commodities are three-fourths immigrants, but settled in the US with US-born children rather than migrating from Mexico to the US without families. Settled immigrant farm workers are doing more days and weeks of farm work. Most say they would like to continue to do farm work, but with an average age approaching 40, there may be physical limits to how much longer the aging farm workforce can perform the most arduous farm jobs such as harvesting fruit from ladders. The average hourly earnings of hired farm workers are rising, which is prompting many farmers to treat their employees better, seeking to satisfy them with bonuses and to stretch them by providing mechanical aids that allow them to work faster. 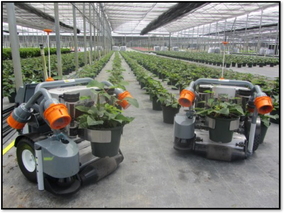 With labor costs set to rise in line with minimum wage increases, such as the $10 to $15 in California by 2022, there is a renewed interest in labor-saving mechanization. Much of the discussion focused on the fourth employer response to fewer unauthorized newcomers, supplementing the current farm workforce with H-2A guest workers. The H-2A program has been primarily an East Coast program, with FL, NC, and GA the leading states of H-2A employment. However, the growth in the H-2A program is fastest in western states such as CA and WA. CA, which accounts for a third of US farm worker employment, is the major state to watch. 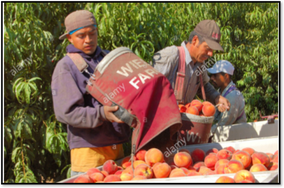 H-2A employment is increasing as large vegetable firms that operate in both Salinas and along the Mexico-US border gained experience with H-2A workers in the desert, and then began to bring H-2A workers to Salinas. Finding the housing required for H-2A workers has been challenging, but some farmers have built housing on their farms, which may presage a return to the 1950s, when many farmers housed Mexican guest workers on their farms. With Hillary Clinton poised to win the Presidency, but with Republicans expected to retain control of at least the House of Representatives, there may be limited scope for comprehensive immigration reform bills such as those approved in 2006 and 2015 that included Agricultural Job Opportunity Benefits and Security Act (AgJOBS), a farm worker-employer compromise to legalize unauthorized farm workers and make it easier for farm employers to hire legal guest workers. If Clinton instead proposes an expanded Deferred Action for Parents of Americans and Lawful Permanent Residents (DAPA) program to give three-year work permits to the unauthorized parents of legal US children, there may be a faster exit from farm work that accelerates admissions of H-2A guest workers. There may also be changes to the H-2A program, including allowing livestock employers who offer year-round jobs to employ H-2A workers for up to three years, as with sheepherders currently. Three-year H-2A visas could lead to new models of guest worker employment, including super labor contractors or employer associations who move guest workers from farm to farm.